for Children and Armed Conflict, a.i. In more than 30 countries in the world, children's lives are directly or indirectly affected by armed conflicts. In my previous capacity as UNICEF's Deputy Executive Director over the many years, I have visited the majority of these countries and seen for myself the effect and impact armed conflict has on the most vulnerable part of the population – – its children. I have met and talked with children in all these countries, listened to their fears and hopes, their reality and their dreams. There are many faces of the suffering of children in the midst of armed conflict and its aftermath. Children are killed or maimed, made orphans, abducted, deprived of education and health care, and left with deep emotional scars and trauma. They are recruited and used as child soldiers, and uprooted and displaced from their homes. Girls are particularly vulnerable and face additional risks, especially of sexual violence and exploitation. All these categories of children are victims of armed conflict, and all of them deserve our attention and protection and to live in countries fit for children. 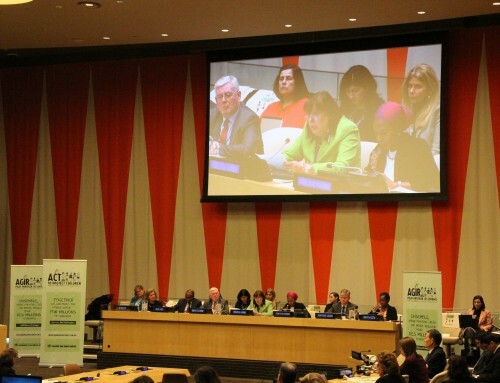 It is very reassuring that over the past several years the General Assembly has repeatedly expressed its strong commitment to protecting and ensuring the wellbeing of war-affected children, including through the establishment of the Mandate of the Special Representative for Children and Armed Conflict and the renewal of the mandate on two occasions since its inception in 1997. And, significantly, this year the General Assembly once again identified the issue of war affected children as a pressing and central priority into the future through the explicit inclusion of this issue as a section in the General Assembly 2005 Summit Outcome document. Collaborative efforts over the last eight years among the Office of Special Representative, UNICEF and other key United Nations entities, as well as Member States, regional organizations, NGOs and other civil society groups, have resulted in significant advances which have created a strong momentum for the children and armed conflict agenda. This includes more extensive global awareness of the issue; significant progress in development of field programmes and training of field personnel, including the deployment of Child Protection Advisers to United Nations peacekeeping operations; NGOs and regional organizations are increasingly focusing on CAAC and strengthening their advocacy and programmes; and, children themselves have become actively engaged in this issue at local and international levels. The past several years have also seen the development and consolidation of an extensive array of protective standards and norms for children. One such instrument, as you are aware, is the Optional Protocol to the Convention on the Rights of the Child prohibiting recruitment and use of child soldiers which entered into force in 2002. 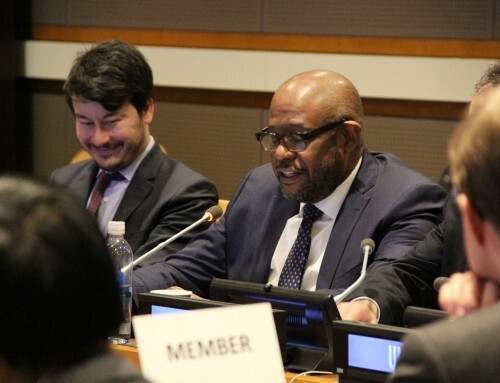 In this regard, I am very pleased to report that so far in 2005, 10 additional countries (Armenia, Benin, Colombia, Eritrea, Israel, Liechtenstein, Nicaragua, Sudan, Turkmenistan and Ukraine) become parties to this instrument. A further 3 have become signatories (Fiji, Somalia and Vanuatu). Children and armed conflict has been on the agenda of the Security Council since 1999 and the adoption by the Council of six far-reaching resolutions on children and armed conflict has also added to the normative protection infrastructure for children. I commend the remarkable and impressive scope and sophistication of Security Council engagement on this issue and the consistent engagement of the General Assembly. It is clear that this progress has been achieved because the key principle of the best interest of the child has remained the pre-eminent consideration among all parties concerned. It is important that we continue to keep this principle in mind in every aspect of what we are doing. Our collective resolve and determination to act in the best interest of the child has helped to generate the necessary consensus to significantly advance the agenda for children affected by armed conflict. Yet, in spite of the tangible progress that has been made, the situation for children in many situations of conflict remains grave and unacceptable. A considerable distance still exists between strong child protection standards and norms on one hand, and the actual situation for children on the ground on the other. In order to close this gap there is a need for the international community to apply and enforce norms and standards on the ground. 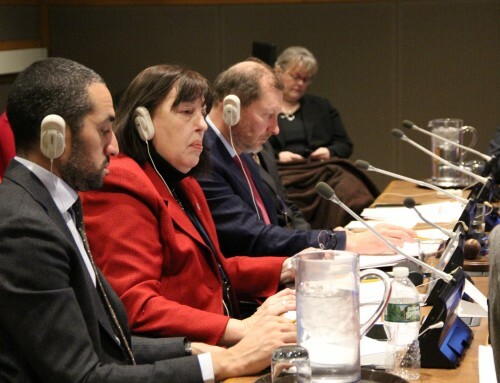 The Special Representative, therefore, has called on Member States to endorse the ‘era of application' campaign for the enforcement of international norms and standards for the protection of the rights of war-affected children, and has made this a central preoccupation and priority of the advocacy agenda of the office. The campaign for the ‘era of application' encompasses four key components: establishment of a monitoring and reporting mechanism to ensure compliance with CAAC norms; promoting and ensuring mainstreaming of CAAC issues in institutions and key institutional processes; continued public advocacy and dissemination of CAAC norms; and, developing and strengthening local capacities and networks. The year 2005 has marked a significant turning-point in the campaign, and marks the beginning of a new and critical phase in the advocacy of the Office of the Special Representative, moving towards the enforcement of protective instruments and standards. In February, the Secretary-General issued his annual Report on Children and Armed Conflict (A/59/695 – S/2005/72), where he proposed a formal, structured and detailed compliance regime to protect war-affected children. The Secretary-General's package includes a rigorous mechanism to monitor and report the gravest child rights violations. In response, the Security Council in resolution 1612 (2005) adopted on 26 July 2005, requested the immediate implementation of the mechanism in situations on its agenda, and decided also to establish its own Working Group on Children and Armed Conflict to review information coming through the mechanism and to recommend appropriate action to the Council against offending parties. Efforts are already underway to set up the monitoring and reporting mechanism called for by the Security Council. The Task Force on Children and Armed Conflict chaired by the Special Representative, has recently endorsed a briefing note providing guidance for the implementation of the mechanism, to all United Nations Resident Coordinators and to Special Representatives of the Secretary-General where there are UN peace-keeping or political missions. Mainstreaming of the concerns of children in the United Nations system entities and in system-wide activities, as well as in other key entities outside the UN system, is a principal element in the institution of an ‘era of application'. In the past several years important mainstreaming initiatives within the United Nations system and elsewhere have begun to take hold. However, continued vigorous and strategic advocacy is required to ensure that these gains do not dissipate. Ultimately, for the protection of war-affected children to emerge as a consistent cross-cutting issue in policies and programmes there must be a system-wide commitment, engagement and action on this agenda. Public advocacy and dissemination is key, and entails two related endeavors. First, we need to ensure that the international and local standards for the protection of children in situations of armed conflict are much better known, especially where it matters most, on the ground. Second, we must transform public awareness into a critical mass of public outcry and repudiation, creating a political and social climate which makes the abuse and brutalization of children entirely unacceptable. The central importance of local civil society groups and networks in advancing the CAAC agenda cannot be stressed strongly enough. Without the involvement of community leaders and institutions on the front line — religious organizations, teachers, parents, local non-governmental and governmental organizations and institutions — there can be no deep or sustainable impact on this agenda. Only local civil society can protect and ensure the wellbeing of their children in the long term. Therefore, the work must be done through them, and emphasis should be placed on supporting and enhancing their capacity to implement actions required to promote and protect the rights of children. At the same time, we need to better understand and promote indigenous cultural norms that have traditionally provided protection for children in times of war. Where formal structures break down during conflict, deeply rooted traditional norms often represent an important frontline of protection for children. Traditional norms should be seen as an important complement to international standards. Member States bear a central and immediate political and legal responsibility for providing effective protection and relief to children within their territories. In this regard, Member States constitute the first ‘destination for action' and the first line of response, ultimately playing the key role in ensuring an ‘era of application' of international standards and norms for the protection of their children. Any action by UN entities and other international partners should always be designed to support and complement the protection and rehabilitation roles of national authorities and actors. Ultimately, close and effective collaboration and complementarity of work of the key actors is critical to the advancement of the agenda and improvement of the lives of war-affected children. The work of the Special Representative must be viewed and understood in the context of a division of labour between advocacy and operational actors, between the Office of the Special Representative and UNICEF, and between the Office of the Special Representative and UN field teams. It should be emphasized that the Special Representative does not conduct operational activities or programme development on the ground, and such responsibility rests with UN entities such as UNICEF, UNHCR, OHCHR and DPKO, and with operational NGOs, whose mandates, field presence, experience and capacities enable them to undertake this role. The Special Representative articulates ideas and proposes initiatives which then are implemented by appropriate operational actors. The Special Representative serves as a resource for these operational actors. Thus, the Special Representative's aim is to build a coalition of support at the global, regional and national levels for the operational work of partner agencies in taking forward the agenda of war-affected children. For the agenda to advance, it is critical to ensure effective division of labour and complementarity of the roles of the key UN actors, NGOs, and national governments. 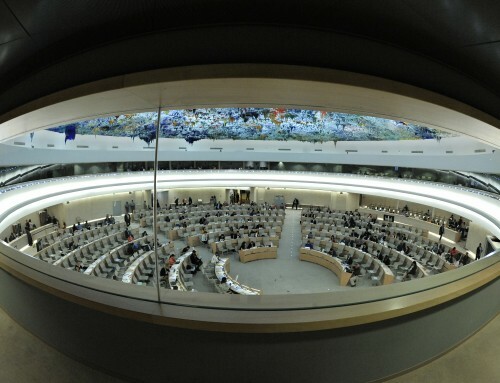 Over the last month, the Office of the Special Representative has gone through an exercise of re-visiting the key elements of the General Assembly resolution which mandated OSRSG-CAAC (A/RES/51/77). I have drafted Terms of Reference that abide by the mandating resolution and which focus in particular on advocacy, monitoring and reporting, mainstreaming and coordination. This is also in line with one of the recommendations from the above mentioned Comprehensive Assessment. As you are aware, I have been serving as the interim Special Representative of the Secretary General since August this year. 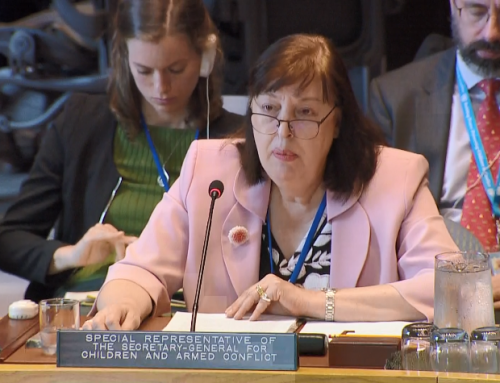 During this time, I have noted that while much has been accomplished over the years as outlined in the report before you (A/60/335), much still needs to be done to ensure the necessary protection of children in conflict situations. In 2005, the Office of the Special Representative was placed on the Regular Budget of the Organization and has been working under a streamlined structure. While the Office is very small, its staff is committed and dynamic. Over the last two months I have positioned the office to focus more clearly on its ‘comparative advantages' and ‘value-added' role. I have emphasized in particular the imperative of close coordination with other parts of the UN system in advancing the agenda. The need to focus on the core mandate and avoid dispersion of efforts, which can be a temptation when fundraising for voluntary contributions, has been facilitated by adherence to regular budget limits. Having come from within the system, I have been able to appreciate how the issue of Children and Armed Conflict is a subject on which we share a resounding moral consensus, yet at the same time it cries for further attention and concerted action. We need to move towards further mainstreaming within the system (which is not always as quick a process as may be imagined). More work is also required to build national networks and sub-regional networks for advocacy and for the protection of children affected by armed conflict as well as for reporting. Finally, let us not forget that it is very important for us to reach out more vigorously to children and young people themselves, and enrol them in the struggle for the protection of other young people so they can become themselves advocates on behalf of children affected by armed conflict. Children must be given the chance to lead the movement for the protection of their peers who are caught up in situations of conflict.